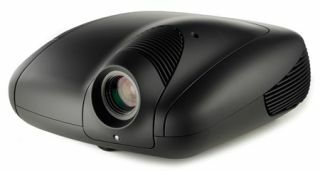 CEDIA EXPO 2011: SIM2 launches Nero 3D projector range | What Hi-Fi? SIM2 is celebrating its 15th anniversary by showcasing 15 projector models here at CEDIA EXPO, including its new Nero 3D range and an LED model with an ultra-long lamp life. You can't properly tell from the picture above, but SIM2's new Nero range has an appealing matt-black finish - not just for style purposes, but to make the projector light-absorbent, so that it's only its beam that shines out in your cinema room. There are four models in the Nero range - all single-chip DLP projector designs, using active-shutter glasses for their 3D delivery. They share some technology from SIM2's flagship, £30,000 Lumis 3D projector, which we will review in the Temptations section of our next issue, out later this month. "The Nero is a big step up in performance for single-chip DLP projectors," says Alan Roser, managing director of SIM2 UK. The four new SIM2 Nero projectors are priced from £13,000-£19,000 in ascending order of their brightness capabiltiies and lens options. They'll be available this month, and we hope to have one in our test rooms shortly. SIM2 is also launching a new Mico150 3D model - an LED-based projector that claims to offers a 30,000+ hour lamp life, yet deliver the exceptional brightness needed for effective 3D projection. The SIM2 Mico 150 will be available in October, priced from £18,000. For a whistlestop tour of the new SIM2 models here at CEDIA EXPO 2011, check out this YouTube video.